Our expertise in comfort helps our youngest patients relax. We love children, and have the knowledge and experience needed to provide your family with child-friendly dental care. Starting your child on the path to ideal dental health begins with his or her first visit to Dr. William Linger's dental office. This first impression will set the stage for your child’s initial feelings toward dentistry, so we work hard to make each experience fun and comfortable. We offer comprehensive oral health care for your infant, child, and adolescent, while utilizing state-of-the-art technology. Every child is unique and deserves the personalized attention they receive at our office. Dr. Linger has been a family dentist in Charlotte NC for over 20 years. It’s very important for your child to feel comfortable in our office. It is our goal to create a safe place with a fun atmosphere for your little one to enjoy. Your child’s appointment will be comfortable and enjoyable because of the extensive training our team has received and the relaxed environment that we have created. We cultivate a relationship with each of our patients, which not only ensures better children’s dental care, but also turns a visit with our doctors and team into a visit between friends. Our team members look forward to enjoying a long-term relationship with both you and your children. We take special notes on each child during the visit and make them feel special. Because they are! We care and are knowledgeable on what techniques work the best for your child. We create an atmosphere of collaboration with parents, making sure you have a clear understanding of the treatment, follow-up, and solutions to your child’s dental health. We believe in continuing education and as we keep ourselves up-to-date we will also keep you up-to-date on the latest equipment and techniques used to treat your children. Dr. Linger Serves on the Scientific Advisory Board for America's Tooth Fairy, a non-profit organization to help educate and prevent dental disease by improving access to care for children. When should your child’s first dental visit be? The American Academy of Pediatrics and the American Academy of Pediatric Dentistry recommend that infants be seen shortly after the first tooth erupts or no later than their first birthday. 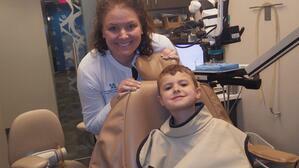 This first visit will help establish a dental home for your child. The earlier you start, the better chance we have to prevent any potential problems. In addition to checking for decay and other conditions, our staff will teach you how to clean your child’s teeth properly, identify your child’s risk for cavities, and offer you helpful advice and information that will help your child build a lifetime of good dental habits. Some dental problems begin very early in life. One concern is early childhood tooth decay, a serious condition caused by a child staying on the bottle (or breast) too long. Another problem is gum disease. About 40 percent of children two to three years old have at least mild inflammation of gum tissues. Oral habits (such as digit sucking) should also be checked. The earlier the dental visit, the better the chances of preventing problems. Strong, healthy teeth help your child chew food easily, speak clearly, and feel good about his or her appearance. Primary teeth are important because they help with proper chewing and eating, help in speech development, and add to an attractive appearance. A child who can chew easily, speak clearly, and smile confidently is a happier child. Healthy primary teeth allow normal development of the jaw bones and muscles, save space for the permanent teeth, and guide them into place. If a baby tooth is lost too soon, permanent teeth may come in crooked. Decayed baby teeth can cause pain, abscesses, infections, and can spread to the permanent teeth. Also, your child’s general health can be affected if diseased baby teeth aren’t treated. Remember, some primary molars are not replaced until age 10-14, so they must last for years. We are asked this question many times. We suggest you prepare your child the same way that you would before their first hair-cut or trip to the shoe store. This will not be the frightening experience you may remember from your youth. If you are nervous about the trip, then the less you say the better. You cannot hide your anxiety from a child (they have radar for these things). We encourage you to read one (or two) of the many children’s books about the dentist as a nice way to prepare. Your child’s reaction to his first visit to the dentist may surprise you. Tooth decay and children no longer have to go hand-in-hand. At our office, we are most concerned with all aspects of preventive care. We use the latest in sealant technology to protect your child’s teeth. Sealants are space-age plastics that are bonded to the chewing surfaces of decay-prone back teeth. This is just one of the ways we will set the foundation for your child’s lifetime of good oral health. Your health and peace of mind are always our primary concern; therefore, we use state-of-the-art sterilization procedures. After each patient’s visit, the treatment area is thoroughly disinfected. We ultrasonically clean and heat-sterilize all non-disposable instruments. Our staff wears gloves and masks during procedures. Please feel free to ask us for information on the measures we take to ensure the safety of you and your children or a tour of our sterilization area. Education and prevention are a key part of our practice. 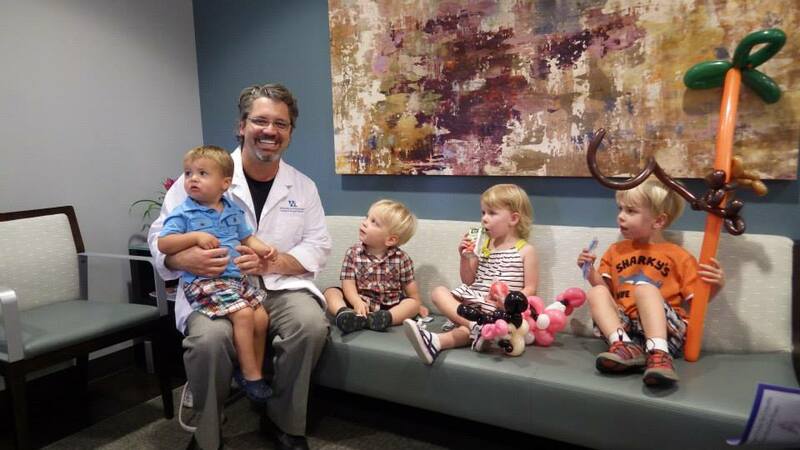 We take the time to explain the proper way to take care of teeth, so our patients learn good habits at a young age. We focus on preventative regimens based on a child’s individual needs and risk factors as recommended by AAPD. When you are considering a Pediatric dentist in Charlotte NC we hope that you will give us an opportunity to serve your family. 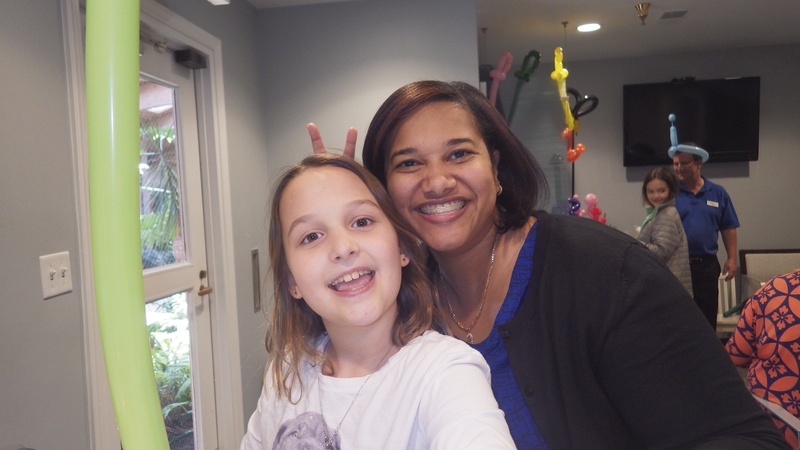 We love our little patients and our staff knows how to make them comfortable and happy. Contact us to set up an appointment. 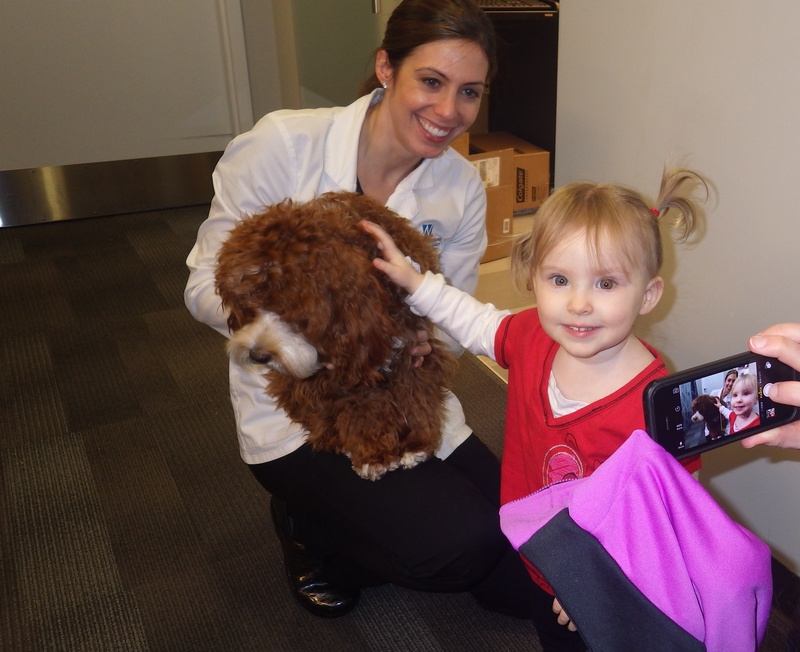 Kid's Love Sadie The Therapy Dog! Dr. Linger and the entire staff are like family! Going to the dentist is no longer something I dread, in fact, I get a little excited since I enjoy talking to every single one of them! We were referred to Dr. Linger after a horrible experience with another dentist and it was the best thing we did! He addresses every issue and very patient with our questions, concerns, fears, etc. I highly recommend Dr. Linger and his staff! My family and I have been patients of Dr. Linger's office for over ten years. We found Dr. Linger because my husband needed dental work but needed to be sedated for the smallest procedures. After watching the care he was given by Dr. Linger and his staff I made appointments for myself and our children. I wholeheartedly trust Dr. Linger and his staff with our dental and oral healthcare needs! The staff is top notch! We have been very lucky to have built a great relationship with them. I know they truly care for us and our children. They have even added an anti-anxiety (hypoallergenic) dog to their family. Sadie is a wonderful addition and is the sweetest ever! I have referred numerous patients to him only because he is the best. My friends that I refer agree wholeheartedly and thank me for introducing them to such a stellar dentist and staff. If you don't love your dentist, you will love Dr. Linger and he is great at what he does.